Senior Joe Rumfelt, of the Ballard Christian Eagles is the first defensive star to be named an NHFCS Athlete of the Week, in 2014. Joe's 18 total tackles were an essential factor in making Friday night's big rivalry game with the Lighthouse Warriors such a 'nail-biter'. One of the more dramatic moments came when Joe recovered a fumble in the end zone for a defensive TD. Another exciting moment came when Joe intercepted a Warrior pass and returned it 50 yards. While his Eagles came one point short, they kept the game close, thanks in big part to Joe's incredible defensive performance. Some coaches have asked the NHFCS to hold off on certifying rosters because they were still seeking to add some homeschool athletes to their "extremely thin" rosters. Some athletes have joined teams in this past week. 1. A majority of the team being home-educated for the bulk of their current secondary education. 2. The actual identity of team personnel, for team rankings. No additional athletes should be added after that date. Each Athlete's academic status belongs in his Bio Notes. While we've not ever confirmed any "post-season stacking" of rosters, it should not be made easy to do, either. - The primary reason for this accountability is to protect all the teams from scurrilous allegations by providing a simple & uniform manner of providing evidence of an athlete's educational status. 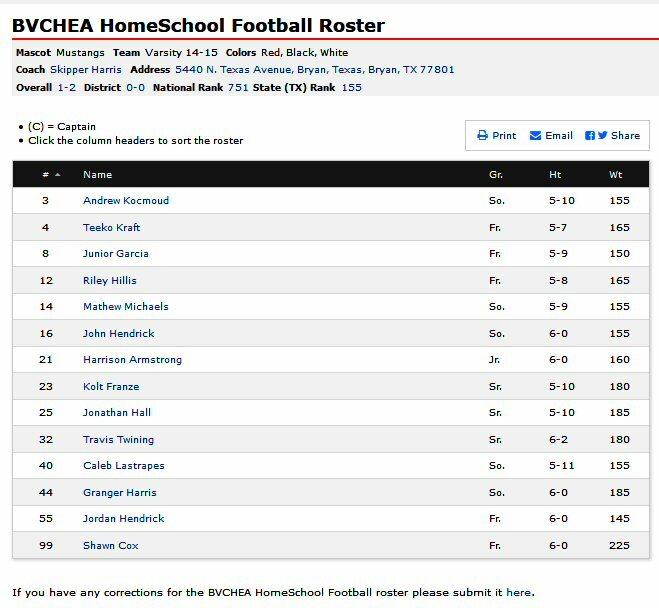 - The NHFCS encourages competing homeschool teams to keep each other accountable by asking for complete & accurate team rosters. Current leagues & conferences are already doing this. - The line-by-line public affirmation process has helped several teams this year, to silence the unfounded rumors that seem to constantly be whispered. 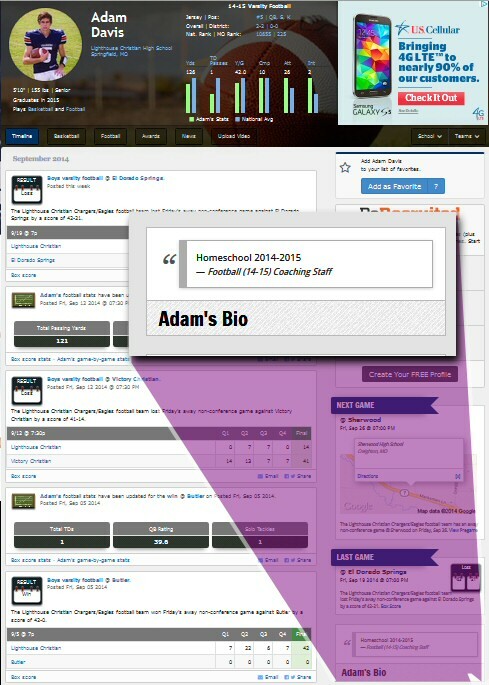 Adam does the bulk of his secondary studies in the home. 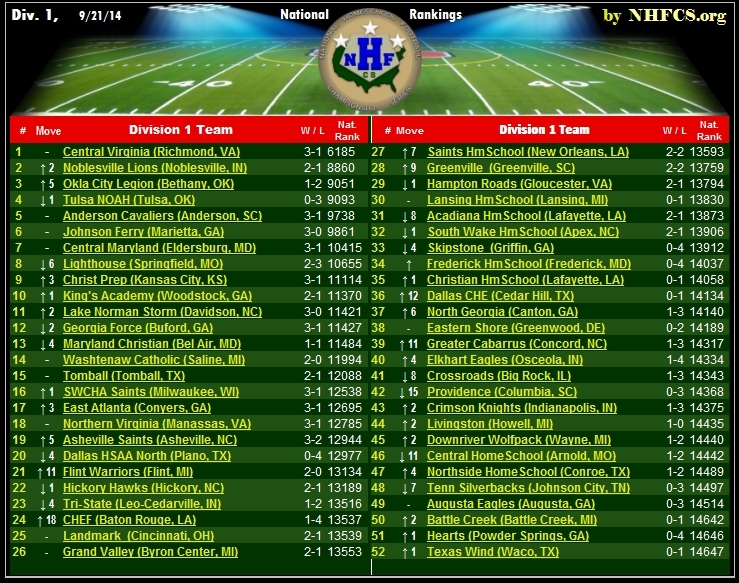 A new # 1 team is named this week in Div. 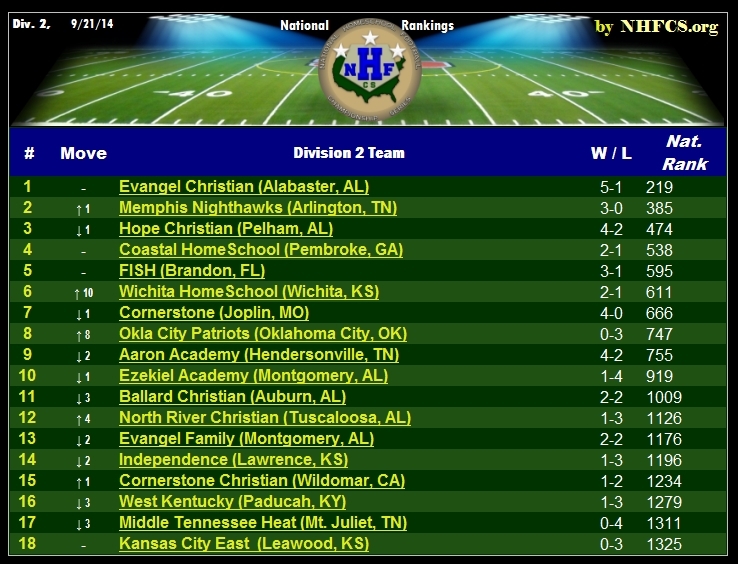 3 homeschool football. 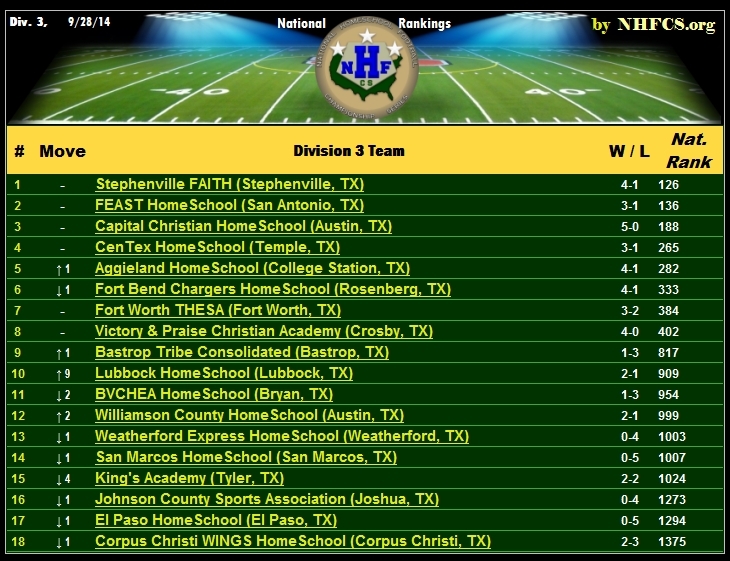 Stephenville FAITH continues to assert themselves in this very competitive and high-energy version of tackle football. 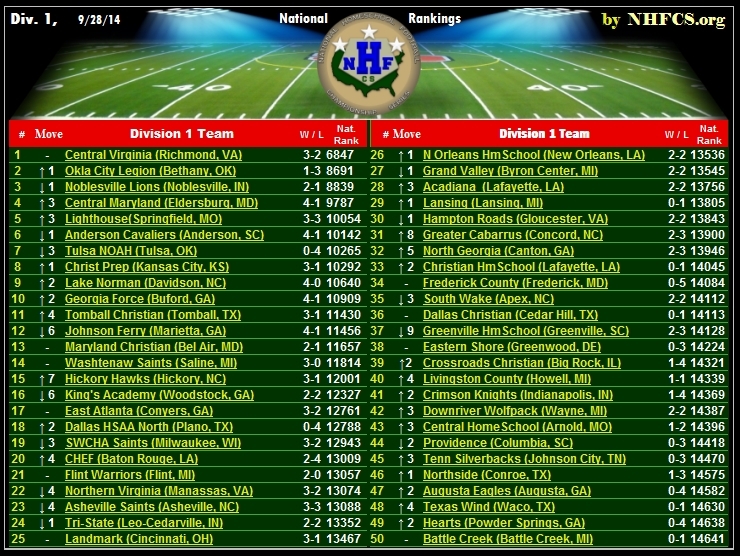 Several new teams are being added to the national rankings as they report results of the threshold 3-game minimum required by Maxpreps. This previous week had no shortage of great performances. The NHFCS is pleased to announce Senior, Michael Cheatham, of The Victory & Praise Sharks, from Crosby, Texas, has been selected as the Athlete of the Week in Division 3 Homeschool Football. Michael amassed a staggering 357 yards rushing, along with 45 yards of receiving. He scored 8 TDs which led to his team's 87-42 win over Texas Christian, last weekend. 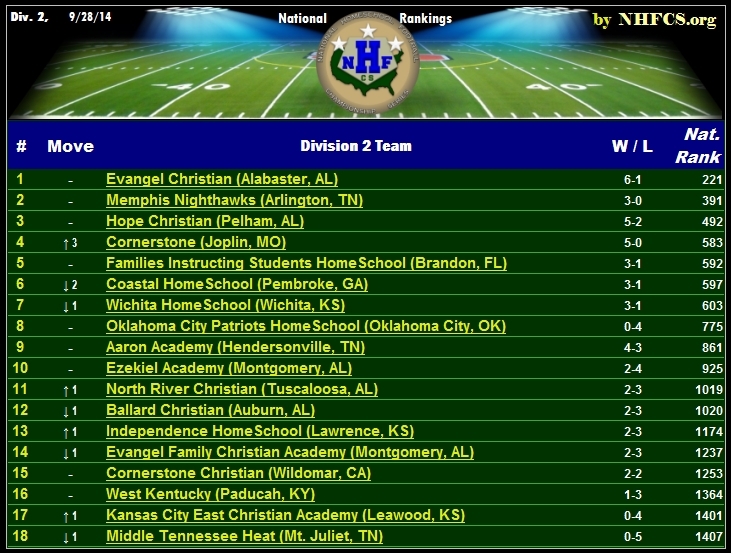 Victory & Praise Academy is a homeschool team in the TAIAO Conference and their 2-0 start puts them in the driver's seat for the 2014 conference championship honors.